Posted in: Computers, Home Projects, MMOs. The Battle Chair is complete. How great is this? Whatever computing you want to do, you can do it from the comfort of the recliner. The 7Flex arm makes this all possible. It has a 24″ reach, which is just enough to put the monitor directly in front of the recliner with enough room to reach the handle to open the leg rest. It goes together easily and is high quality and sturdy. And affordable at $250. The computer is the recent Gaming Desktop from Cyberpower. The case is admittedly larger than required for this application. My Bad. A mid-tower would have done nicely to hold the Core-i7 950 with the single Nvidia 470 graphics card. This graphics card is plenty to run Wow in style. No need for SLI for Wow. A 20″ Acer LED back-lit monitor is very slim [ 3/4″ ] and light. Although the arm is happy with as much as 12 lbs, this monitor is only 6.2 lbs. At $100 on sale at Newegg, the monitor is great, and cheap. 1600×900 resolution is plenty for gaming. The Logitech K800 Wireless Lighted Keyboard. So you can work / battle with the lights down and still see the keyboard. The keyboard is so smart that it lights up when you move your hand over the keys and dims to save batteries when you move your hand away. It’s just great. The house is now wired with two additional Ethernet cables and this one is a Gigi-bit connection back to the router. Not all the connections in the house are Gigi-bit but the two desktop machines are connected at GB speeds. 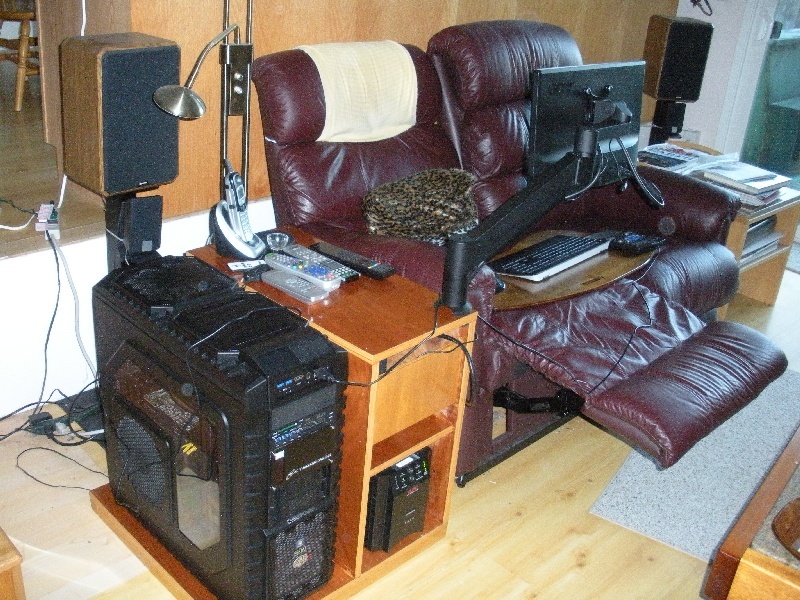 A 2+1 Sound system with the speakers strapped to the TV Rear speaker stands behind the chair and the sub-woofer in the cabinet above the UPS. UPS is required in my area due to frequent power glitches that would cause reboots. A Cyber Snipa gaming keypad – wired – under my left hand for hours of World of Warcraft fun. I made the cabinet from 3/4″ plywood – 1/2 sheet is required – with 1/2″ for the baffles / stiffeners front and back. Luan plywood gives the cabinet a mahogany look. The edges are finished with iron-on tape, and the cabinet is finished with several coats of marine grade poly urethane varnish. The battle chair is everything that I hoped. I no longer have to overheat my laptop playing games. I may not buy another laptop ever. My next portable purchase may be a tablet.